I'm a fairly open-minded guy and tend to look at almost all gear as having its time and its place. 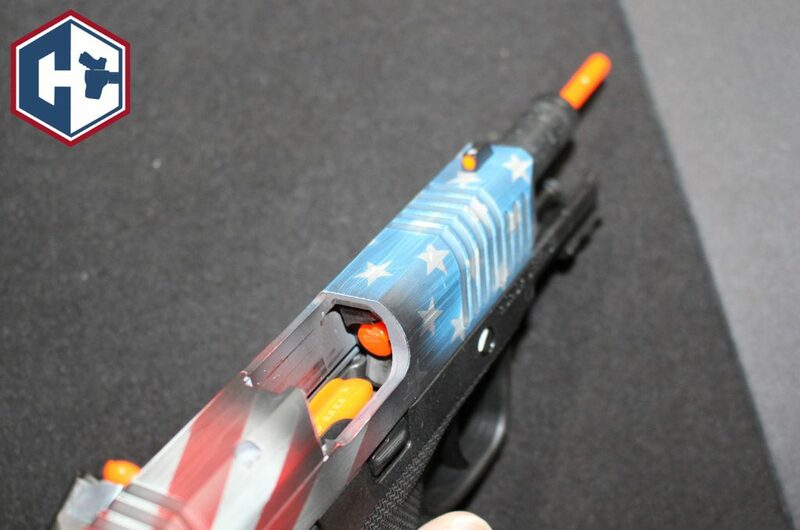 Rarely do I find something and think, “every gun owner should have one of these.” This is one of those times. Before I tell you anything about BarrelBlok let me also tell you that we are talking about a product that retails for less than $15 and, frankly, that does play into my strong recommendation because we all have a limited budget to spend on our gun gear. As a general rule I encourage people to allocate that budget to training first and gear second but for an under $15 product just trust me and order one. What will this product do? It will ensure that your firearm is inert and incapable of firing when you do administrative handling or dry fire practice while also preventing slide lock in order to faciliate more realistic dry fire with reloads and malfunction clearing. When you purchase BarrelBlok it comes in a nice package with some instructions and information. Inside that package are 1 BarrelBlok and 3 MagBloks (caliber specific). Shown above is what came in the 9mm BarrelBlok package and an image of those products in place with my Sig P229. We will discuss it further below but the BarrelBlok comes with three MagBloks so you can easily practice reloads and malfunction clearing without having to purchase additional MagBloks. When you first get out the BarrelBlok note that at the end it has what appears to be several “sections” which are divided by marks. These marks are meant to allow some ease in trimming the BarrelBlok to your preferred length. You want it to be long enough to be clearly visible from the end of the muzzle without being overly long. I trimmed off 2 “sections” and that seems to fit really well for the majority of my firearms. The instructions talk about using a razor blade but my trusty pocket knife did the trick. Notice the BarrelBlok has a bit of a curve. 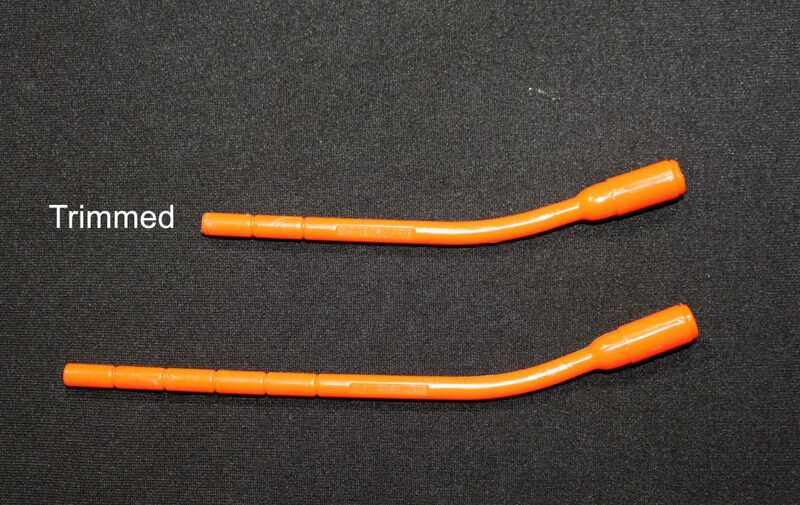 This is intended to aid in the inserting of the BarrelBlok into the chamber of the firearm. With the chamber open, just insert the BarrelBlok into the barrel and push it in gently. With some of my firearms it might require a little twisting and a slight amount of force but it should slide in fairly easily. Push it in all the way until it sits snug in the chamber end of the barrel. Since the BarrelBlok is chamber specific it should fit really well. Once inserted you should have a visual indicator, both out the end of the barrel and from the chamber, that the firearm is now inert. It is completely incapable of firing or even of chambering a round. If you try (on purpose or accident) to chamber a round you will cause what is essentially a double feed and the gun will lock. There is some debate about the potential of damaging one's gun by dry firing it with nothing in the chamber for the firing pin to strike. That is one of the core arguments of using dummy rounds in your dry fire. 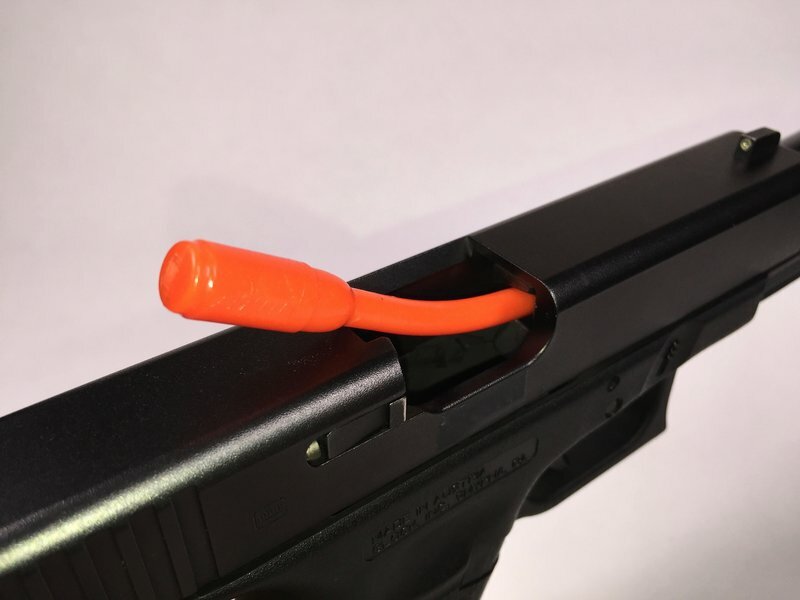 If you are in the camp of feeling that there is a potential concern then BarrelBlok should alleviate that concern since it sits in the chamber and provides a solid surface for the firing pin to strike. With BarrelBlok installed you are now free to do your training or administrative handling without any concern (to yourself or others) that the firearm could discharge! To install the MagBlok just insert it into your magazine the same way you would a round of ammunition, keeping the “channel” which has the caliber stamp facing up. 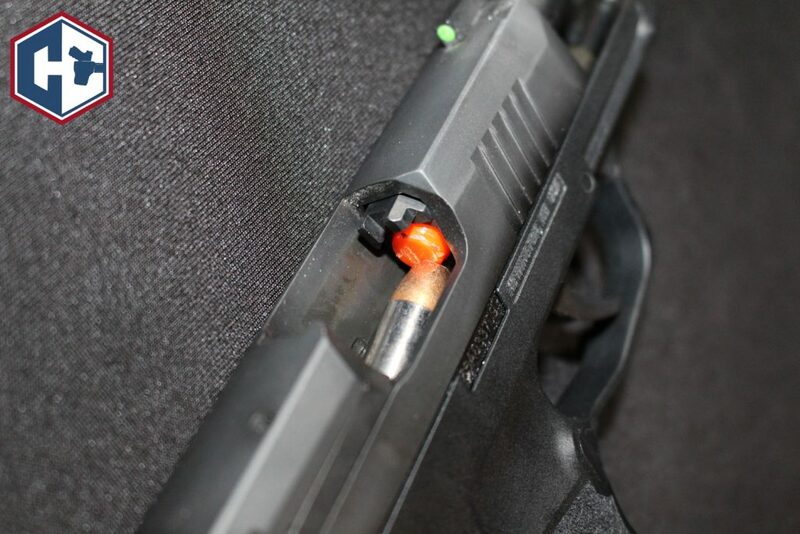 With the MagBlok installed, the follower of your magazine is depressed such that your slide won't lock back even though your magazine has no ammunition. Having disabled the slide lock, you can now practice tactical reloads and malfunction clearing without creating any bad training scars or muscle memory mistakes. Since your order of 1 product comes with 3 MagBloks you can load up several magazines and have a grand old time! In order for Barrel Block to effectively work as designed, it has to be caliber specific. Below is an animated picture of the Barrel Blok in various of my 9mm handguns. I would get a Barrel Blok for each caliber of firearm that you own. 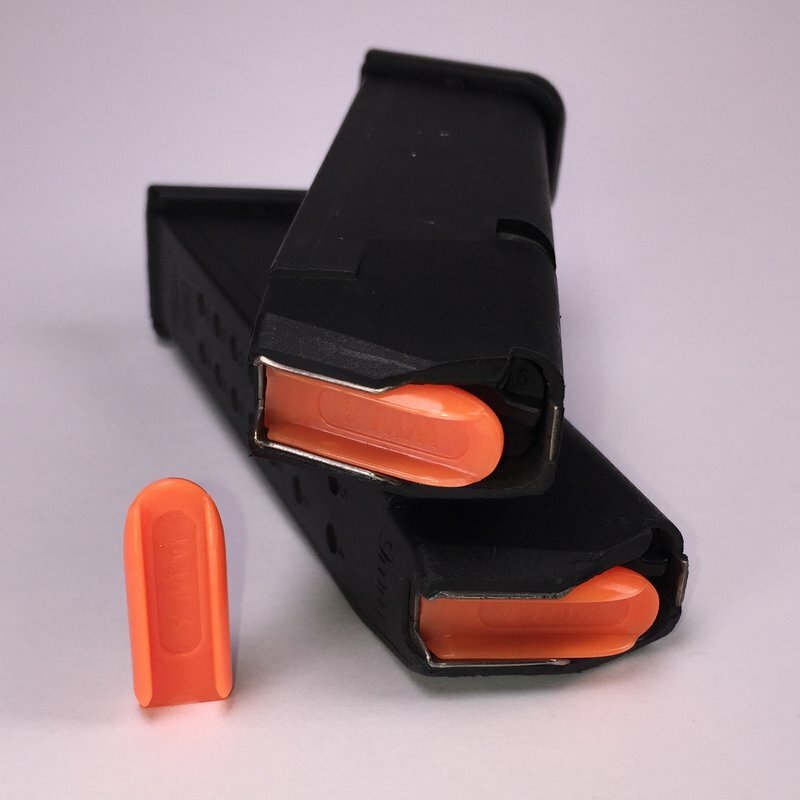 Each caliber of Barrel Blok is a different color making it easy to know which is which and ensuring you don't use the wrong product on the wrong gun. 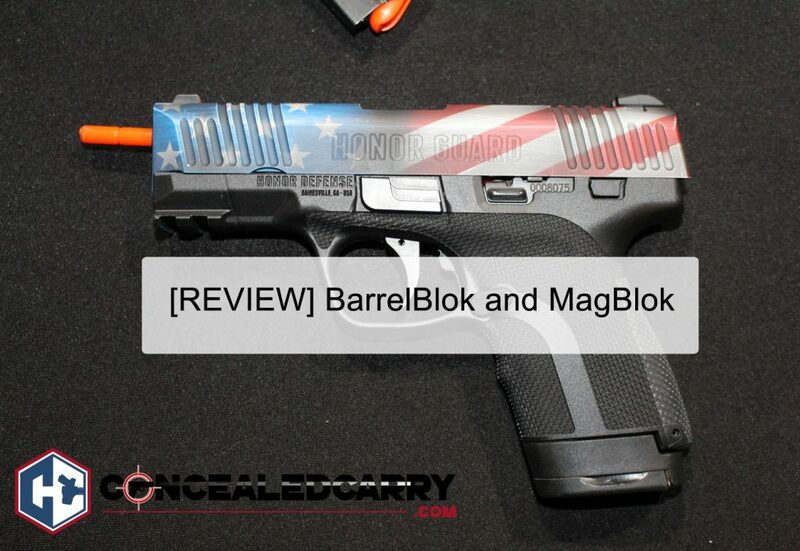 In addition to color the Mag Block has the caliber stamped into the product. I do a lot of Dry Fire with my SIRT pistol but neglecting to do any training with your real firearm is a bad idea. When I run any dry fire drills with my real gun I insert the MagBlok right away. If I'm not using a laser insert of any form then I also insert the BarrelBlok. I also find myself using the BarrelBlok in environments when I'm with others and I want to communicate that the firearm is safe. I recently did a Gun Safety presentation for a group of youth in a church group and BarrelBlok was a must. I always take it with me to the range and generally like to have it with me in a myriad of situations. It looks like something all firearms owners should have in their range kit.